The right floor can be key to a successful bathroom makeover. As summer fades into autumn and the temperatures plummet, we start spending a lot more time indoors. This inevitably leads to projects around the house. One of the rooms we often turn to is the bathroom. 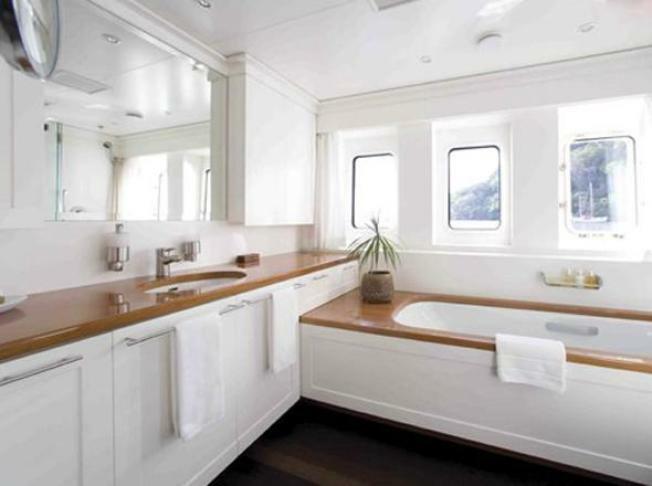 In fact, you might be thinking of remodeling an existing bathroom or even putting in a new one. In which case, you’ve probably obsessed over different styles of sinks, toilets and bathtubs. But did you know that different floors can affect the longevity of the bathroom and save you a headache when the eventual leak springs? Let's review some of the different flooring options and list some pros and cons that will help you make an informed decision. This is the most common choice for a bathroom floor and a pretty good one. Linoleum is oil based and repels moisture, which can spell doom for a bathroom floor. However, because of the way it’s installed, water and moister can creep in through seams, causing warping or blisters. They sure look great, especially when the adjoining room also has wood flooring. Unfortunately, in this case looks are very deceiving. Wood floors are one of the worst choices for bathroom floors. Wood warping and cracks will eventually form and cause leaks throughout the home. Resist the urge when it comes to wood and bathrooms. These are great choices for bathrooms. Both repel moister and are extremely durable. The only downside is that they are expensive. This is probably the most durable and cost effective choice for bathroom flooring. Sheet linoleum does not suffer from seams, so moister can't creep in and cause warping or blistering. A less expensive alternative to stone, concrete is just as durable and aesthetically pleasing. These days concrete can be stamped and colored to make it look very much like stone. Our friends at Creative Concrete can do some really amazing things, so be sure to check them out. These are some of the most common bathroom flooring options, and we hope the pros and cons listed above will help you make an informed decision. Remember, Michael & Son’s Handyman department can make your remodeling dreams a reality, so call today.